Over the weekend I had some fun experimenting with tea: tea infused butter, tea leaves ground into dough and this, tea-infused dulce de leche. As someone who doesn’t really drink tea, but loves the taste, this is a wonderful way to experience its flavours. 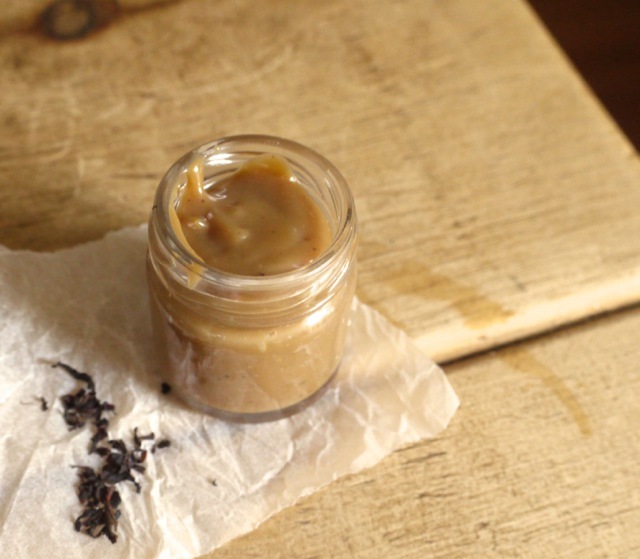 Stove top dulce de leche is a completely therapeutic – a good forty minutes or more are spent at the stove, slowly stirring, as milk and sugar evaporate to become something rich, thick and glossy, the colour of coffee and resistant to a spoon. Infusing the milk with tea at the beginning means you have to watch the colour a little more closely – the mixture goes brown before it’s actually caramelized – but the process couldn’t be easier, or the results more delicious. I used my tea-infused dulce de leche to make millionaire’s shortbread, the slight bitterness of Earl Grey working beautifully against the sugar sweetness of the caramel. Tea and biscuit deliciousness, all in one mouthful. 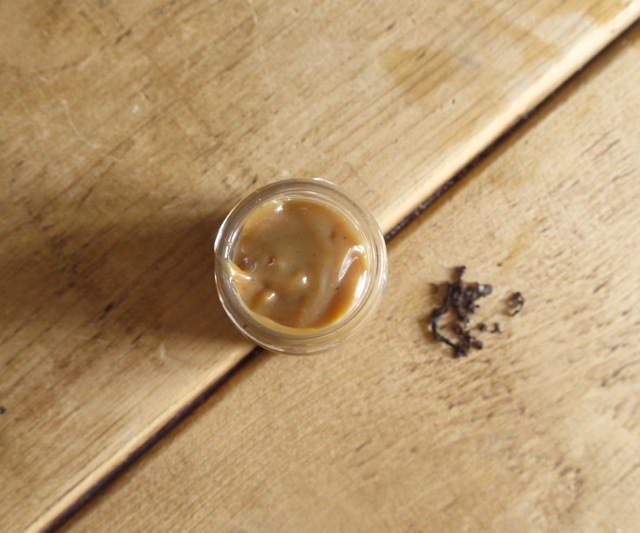 Rich and sweet with the smoky taste of tea, this infused dulce de leche is utterly addictive. Spoon over ice cream, use to sandwich cakes or spread over shortbread as in the photos. In a large, heavy bottomed saucepan, bring the milk to a simmer. Add the tea leaves, stir and leave to steep for 5 minutes. Strain the milk then return to the pan. Add the sugar, golden syrup, vanilla pod and seeds, bicarbonate of soda and salt and bring to the boil. The milk will froth up as it boils, especially if you’re using goat’s milk, so stir occasionally with a heatproof spatula or wooden spoon. Reduce the heat slightly to a brisk simmer/low boil. Continue to cook, stirring frequently, until the mixture begins to thicken and turns a deeper brown (remembering that the tea will make it look more caramelized than it is). If your mixture is catching on the bottom, you may need to reduce the heat slightly, so this process can take anything between 20 – 30 minutes. Once the mixture has started to thicken, reduce the heat to a low simmer and continue to cook until the mixture has the consistency of thick caramel sauce with a rich coffee colour, 15 – 20 minutes. Stir regularly at this stage to prevent any bits catching on the bottom of the pan. Remove the pan from the heat, fish out the vanilla pod using your utensil (remember, the caramel will be very hot), then pour into a large clean jar. Leave to cool completely at room temperature, then use immediately or screw a lid on the jar and store in the fridge for up to one month. The caramel will set fairly firm in the fridge. You can rewarm it in the microwave or in small saucepan over a gentle heat. If it’s too thick to pour, add water or milk, a teaspoon at a time, until the sauce has the consistency that you want. These look LUSCIOUS. I have never made dulce de leche but I can totally understand how satisfying it must be. I love experimenting with tea in cooking – Earl Grey ice cream is a favourite but I’m massively intrigued by your tea infused butter! Do share?! 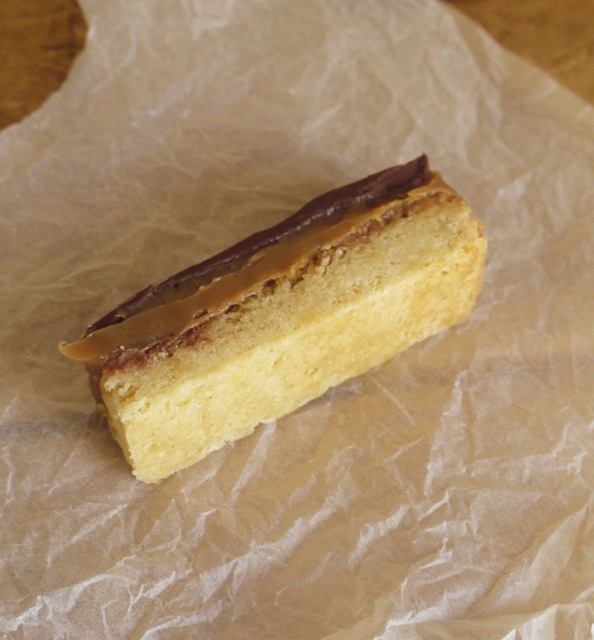 Also, millionaire’s shortbread is such a retro classic! Reminds me of my childhood. What a lovely idea – I do love dulce de leche but so often I think it needs something else whether that’s a kick of salt or the goaty version that smitten kitchen posted a couple of months back. The combination with the fragrant floral notes of earl grey sounds really wonderful. The goaty version is so good! In fact, it’s my default. I first had dulce (or cajeta) in South America and the goat milk version adds a lovely tang that makes the caramel that little bit more interesting. I thought we called it manjar when we were in South Amercia! This sounds so tasty – think I may try it. Dulce de leche is one of my all-time faves. I grew up with the stuff, homemade of course, back in Peru where we call it manjar blanco. I remember eating it slathered on toast for breakfast! 🙂 We also love to use it as fillings for cookies, cakes, and shortbreads very similar to what you have shown here. It’s incredibly delicious and I can’t get enough. I love that you infused it with earl grey tea (one of my favorite teas too btw). I am such a tea hoarder– I have stacks of them on my counter but hardly ever drink them! I’m much more inclined to drink my coffee over tea any day. But I do love the flavors, so you’re right, this is a terrific way to experience them in a different way. I spent some time in Peru after school and had forgotten that they call it manjar! We had it on pancakes for breakfast or spooned straight out of the jar – so good! These look delicious! I lived in Chile for a few months and had dulce de leche everyday, and have struggled to find the really good stuff since being back. I’ll now have a go at making my own! Thank you. Thanks Fiona. I love all the different milk caramels you get in South America. I didn’t spend much time in Chile when I was there but I bet it was every bit as delicious as the stuff I tried elsewhere! I don’t tend to drink tea regularly, but I do tend to love experimenting with it in sweet treats! Infusing it into dulce de leche sounds glorious. I want a whole batch of these bars in my belly! Mmm, sounds delicious! I made my first ever millionaires shortbread yesterday, for my daughter’s 13th birthday today ( she didn’t want a cake), and I have to say homemade certainly is best! I love dulce de leche – after somewhat overdosing on the stuff when I was studying Spanish in Buenos Aires I have let it back into my life recently and am so glad I did. I also like how you can alter it flavour by using different types of milk (I particularly love both the goat version and the coconut milk version) or by infusing the milk first (I tried a long pepper version this winter which was wonderfully peppery). As you know I love anything tea-flavoured although I have yet to try it in Dulce de Leche – I think it is an amazing idea and that shortbread looks to die for! Ooh coconut milk version sounds good! Do you make it in exactly the same way? I know coconut milk can’t always be directly substituted for regular dairy. I know, so many amazing possibilities. I’m thinking coffee next time. Thyme and rosemary also work well. I love the simplicity of your site. This recipe is simple but gorgeous. I am sure it’s really yummy too. You must give it a go. So delicious. Earl grey-flavored dulce de leche? I LOVE. Oooh amazing. So that is how you make thick caramel! Mine always turns out too runny, must be because I dont have the patience to wait that long. Yours looks just perfect! I just love the delicate flavor of tea in desserts and this dulce de leche sounds sensational! You combined two things I adore… that looks AMAZING! Oh my. I am far too excited to try this out; I love earl grey infused treats – beautiful recipe! What a wonderful idea to infuse the milk first, I’ll have to remember that! I love proper dulce de leche, haven’t made millionaires shortbread for years but chocolate and caramel is a tip top combination. Like the Earl Grey addition too. Oh this looks so good–I enjoy the Earl (and love his Lady) and I like sweets–and this is a wonderful combination. Yes! Dulce de leche and earl grey…. what’s not to love about that tasty combination? I love the flavor of Earl Grey in desserts and would have never thought to infuse dulce de leche with it (I’m team goat’s milk)! And since Earl Grey goes well with chocolate too, these bars must be fantastic. Hello, Little Loaf! What a wonderfully creative idea to go with the ‘tea and biscuits’ theme here! 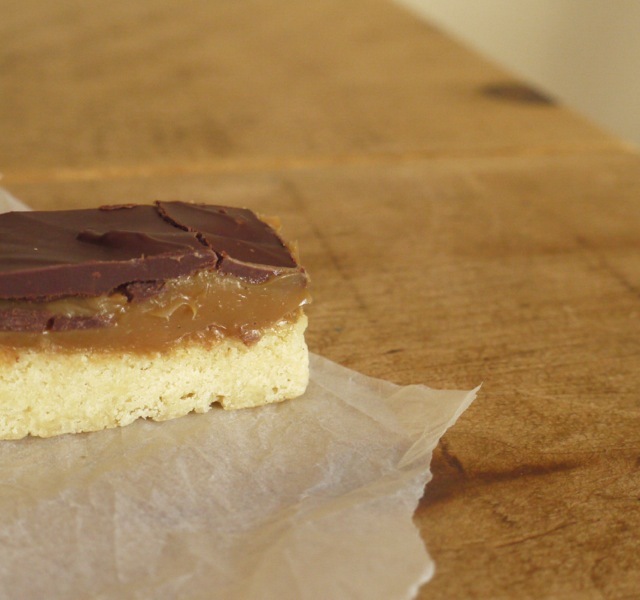 I love millionaires shortbread and have a recipe for it that my sister has been perfecting over about 20 years (!! ), so I think this could be the one for me to try this tea-flavoured caramel in. Thanks! I’ve never actually made dulce de leche from scratch – I’ve done the boiling of condensed milk version but I imagine doing it properly like this is so satisfying! I might try a chai version of this, can think of loads of uses for it! This looks amazing, I am going to have to try making dulce de leche as it’s not easy to get hold of in the South East. I love that you’ve infused tea into this tea time treat!